Product prices and availability are accurate as of 2019-04-22 22:46:36 EDT and are subject to change. Any price and availability information displayed on http://www.amazon.com/ at the time of purchase will apply to the purchase of this product. 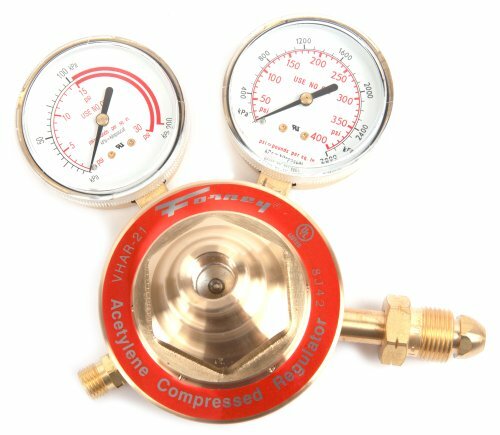 The Forney 1711 heavy-duty Oxy-Acetylene welding kit is a Victor style heavy duty torch kit. Ideal for maintenance, fabrication, Plumbing and do-it-yourselfers. Provides high performance. 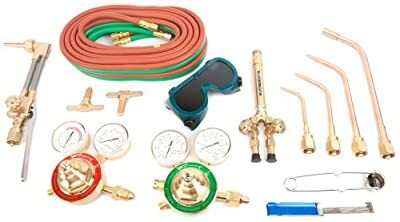 Kit includes an oxygen regulator (87100), Acetylene regulator (87101), torch handle (87102), cutting attachment (87104), goggles (55311), flints lighter (86102), tool-grade hose, cutting tip no.1 (60463), welding tip no.1 (87833), welding tip no.3 (87835), welding tip no.5 (special order), rosebud tip no.8 (87791), check valves (87151) and a tip cleaner (86119). FORNEY INDUSTRIES is one of America's longest operating family-owned metal working product companies. Founded in 1932, Forney offers more than 5, 000 products for the hardware, automotive, farm and ranch and do-it-yourself markets. If you've got metal working questions, we've got answers. We're committed to your success regardless of location size or needs. Welds up to-1/2-inch (12.7mm) and cut up to 8-Inch (203.2mm). includes a 25-Feet top-grade hose. Claims for must be made within 90 days of the date of purchase. Proof of purchase required. This does not cover any product that has been subject to misuse, neglect, negligence or accident, or that has been used in any way contrary to the purpose intended.